Just as the stars and sky were intertwined to form the heavens, their lives were intertwined with the land in the valley called…Wa-ba-shik-ki. In 1680, Robert de LaSalle sent Joseph LaMotte and Jean Quentin Dubois on a quest for a great white river in the uncharted Illinois wilderness. After surviving an Iroquois ambush, they became the first white men to lay eyes upon the unspoiled bounty in the valley of the river the natives called, Wa-ba-shik-ki. 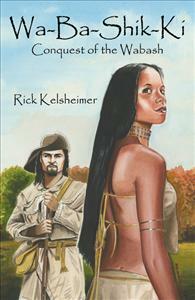 Native and European worlds collide as they make contact with Sinisqua, a young Piankeshaw princess, who introduces them to a pristine, yet violent land. Her people are torn between their tradition and the promise of a better way of life. Wa-ba-shik-ki is a portrait of love, greed, yearning, retribution and perseverance in a pre-colonial land of milk and honey.